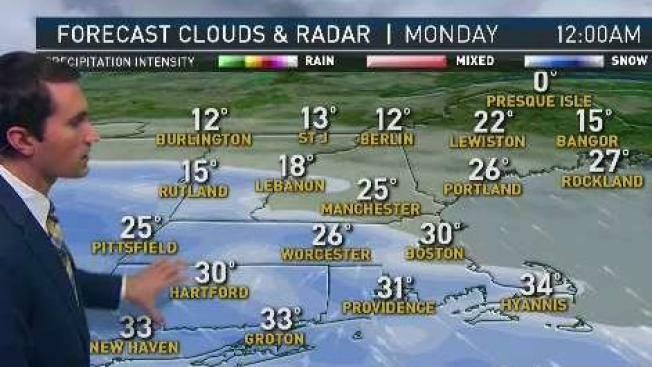 Get ready for some snow – this time in central and southern New England. Today will also be quiet. Temperatures will reach the low to mid-30s and we’ll see a good amount of sunshine. Clouds increase tonight with snow developing after midnight. This will not be a blockbuster storm, but areas along and south of the Mass Pike will see a long duration light snowfall. At this point, it appears 1-3” of snow will be likely. Travel impacts should be fairly limited thanks to the fact that it’s a holiday and the intensity of the snow will be light. 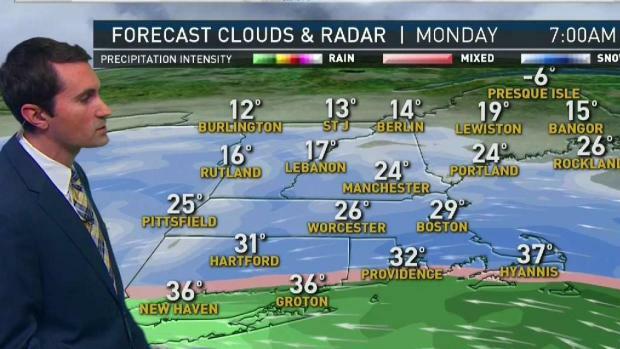 Snow is on the way to New England and should be arriving after midnight. Behind the storm system will be some seasonably chilly air. Temperatures will stay in the low to mid-30s. The next storms system will arrive Wednesday. At the onset, it should be cold enough for snow. Temperatures should climb into the mid and upper 30s. Once temperatures warm enough, central and southern New England will see a switch to wintry mix and rain. Northern New England should see primarily snow. Next weekend looks a little unsettled, but milder. Temperatures will climb into the low 40s. Showers are possible both weekend days, but there is a better chance for wet weather on Sunday. Stay tuned!